Always Aubrey: Are cookbooks obsolete? I love my cookbooks. I have Julia Child's Art of French Cooking, The Joy of Cooking, Martha Stewart, Betty Crocker, Better Homes and Gardens... but even though these lovely books are sitting pretty on the shelf, I continue to turn to the internet for recipe ideas and inspiration. 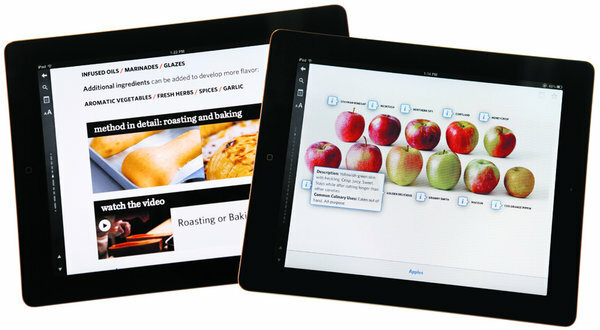 Recently, I came across an article in the NY Times, entitled, "Are Apps Making Cookbooks Obsolete?" With all of the cooking apps available, the portability of tablets, and the vast collections of free recipes online, it's no wonder people are buying fewer and fewer cookbooks. I find recipes in magazines, use Pinterest to save the recipes from the magazine websites, and then browse my pins to plan meals. Even the Culinary Institute of America has an app now! There's something to be said for these online resources. You can have color photos and step-by-step guides, which aren't available in many text cookbooks due to space limitations. You can search for recipes based on the ingredients you have in your refrigerator, instead of scanning difficult indexes at the back of thick books. You can even watch video demonstrations; I recently used this to figure out how to cut a spaghetti squash in two. I do love sentimental things like notes in margins of hard-bound cookbooks, hand-written recipe cards from my Grandma, and things like that. But I admit I drag my laptop into the kitchen frequently, much more so than those books. Like my transition to reading on a Kindle, I definitely have nostalgia for the old books, but I embrace the practicality and enhancements the technology brings to my life! I can't be in the kitchen without my Ipad turned to the AllRecipes.com cooking app. I <3 it. I have about six to seven cook books but I never use them. I sometimes call my Ipad my cookbook. It's just simpler to look up a recipe and to find unique ones.